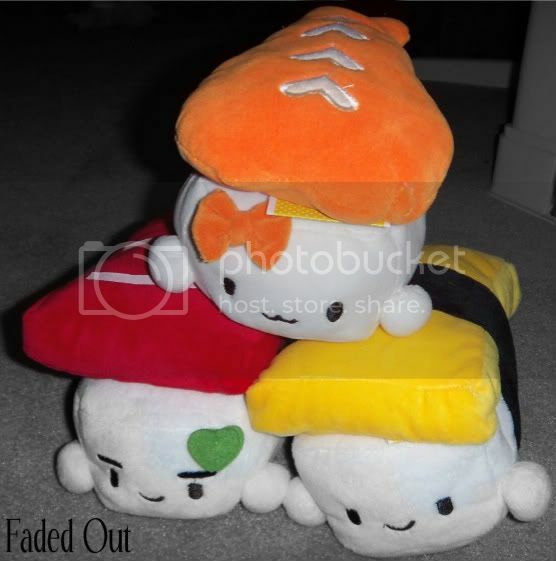 I won a contest from kawaiijunkie.com (their site seems to have disappeared now :/) and won these adorable sushi plushies. Yesterday’s post featured sushi so it kind of inspired me to make today’s sushi related as well! One of them is shrimp nigiri, the other is tuna nigiri, and the other one is tamago nigiri. So cute! I’m so grateful to have won these plushies! It turned into a sort of a mission to win that contest. I told all my friends, made a huge facebook event where at least a thousand people were invited, and messaged every one I knew. Lol, all for sushi plushies. Kinda shows how much I love 1) cute things and 2) sushi. I keep them on my desk, so they cheer me up every day when I look at them. Aww, they are too cute! I wish I had a big enough desk to put tons of cute little things on :( Maybe once we move! I tried sushi before but it wasn't so great to me. Maybe it was the kind I had that tasted like real raw fish. Maybe another kind will make me like it more, lol. It definitely looks delicious! How are you enjoying 2012 so far? I've never tried sushi (I want to though) but those little plushies are so cute! !